Our Business Center is specially designed and equipped to accommodate a variety of events such as conferences, trainings, workshops, presentations of products, business meetings, focus groups etc. It is composed of two conference rooms accommodating up to 80 people and an protocol lounge with a capacity of 20 people. 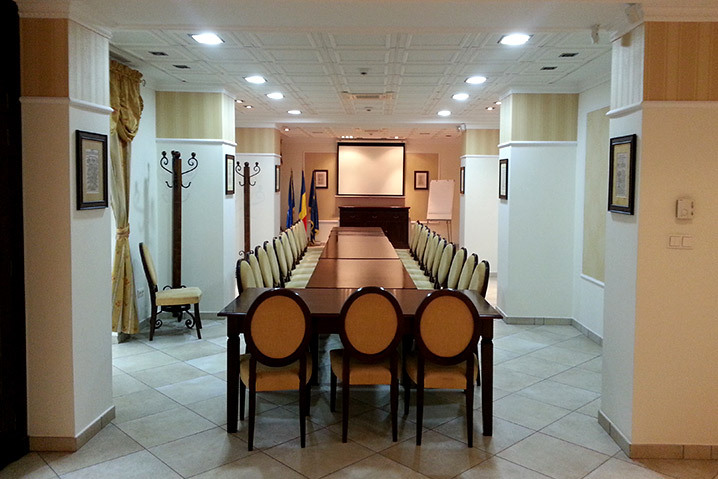 Endre hall – 100sqm, 60 people capacity theater arrangement; arrangement U-Shape – 25 people. Mocsonyi hall – 100sqm, 60 people capacity theater arrangement; arrangement U-Shape – 30 people. Amenities Conference rooms: video projector, projection screen, flip chart, whiteboard, Pin-board, sound system, WiFi internet. Space for arranging and serving Coffee Break community.